I’m bizarrely addicted to watching CNN in the mornings. It’s part of my routine. I can’t function without it. Recently, in an effort to become healthier, I invested in a treadmill. My thought was that all of my CNN time in the morning could just as easily be spent on a treadmill–two birds, one stone, right? The problem I ran into was that I couldn’t hear the TV unless I cranked the volume up to 70. This is a solution, but I don’t like it. I don’t want to keep the volume maxed out on the TV. My next thought was wireless headphones. Good thought, but I don’t have any. I also wasn’t excited about potentially having to switch between audio modes on the TV, having to possibly introduce a stereo receiver, or any other audio shenanigans. So then I had another good thought: I’ll just stream CNN through their website on my phone! I couldn’t get it to work. Okay, I’ll use my wife’s iPad to do it, then! I couldn’t get it to work. Oh, well. I guess I’ll just watch Netflix on the treadmill. Guess what? It didn’t work. Not right away, anyway. With some tinkering, I was able to actually get it working, though! I don’t love the solution because it’s way more than a casual user would ever think to try, but I’m still happy to have it. Add cnn.com to the list of trusted sites. This is what I thought would solve the problem. I thought that for sure the issue was just that CNN wasn’t able to save whatever authentication cookies needed to be saved. However, after adding cnn.com to the list, the page got stuck in an authentication loop where the page would just keep refreshing and asking my to choose my provider. Add adobe.com to the list of trusted sites. This was the key. It appears that the authentication is routed through adobe.com, and a cookie is expected when you get back. The cookie was being blocked, and that’s why I was then asked to authenticate again. There was a fourth thing, but it was a little different. I wasn’t able to scroll the list of available programming. I was able to fix that by zooming out with Ctrl + -. Like the rest of my solution, it wasn’t ideal, but it worked. So, at the end of the day, I had what I wanted. 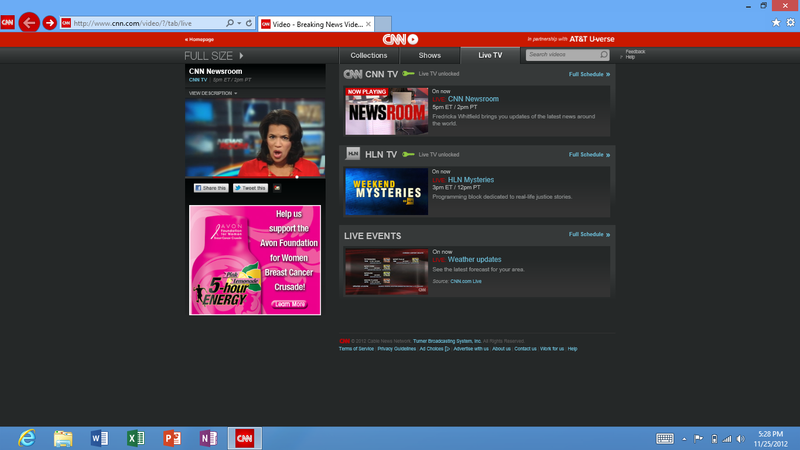 I can stream CNN live from my Surface, and I can use headphones to hear what’s going on over the wirrr of the treadmill. I guess I need to find a new excuse to avoid working out in the morning. I have Motorola Rokr bluetooth headphones that work well with my Windows Phone, iPad and Surface. Speaking of hearing, have you experienced any weirdness with the sound on your Surface? My wife has one and the speakers suddenly went all muffled and static-y. It sounded like they were blown! Running sound out to an external speaker was fine indicating the sound card and drivers were probably working correctly. I ran updates and restarted the device which seemed to clear up the problem, but I don’t know the cause. Anyway, if you or anyone reading this experiences the speakers suddenly failing, hopefully updating and restarting will work for you as well. Hmm… I can’t recall any problems with the audio, but I’ve pretty much only used headphones. I had a similar issue with my wireless connection over the weekend, though. No networks were showing as available. Restarting the device solved the problem. It is Windows, I guess. If all else fails, reboot!